Yuengling, best known for its beer, resurrected its ice cream production this week. Yuengling resurrected its ice cream this week after stopping production of the sweet treat 28 years ago. 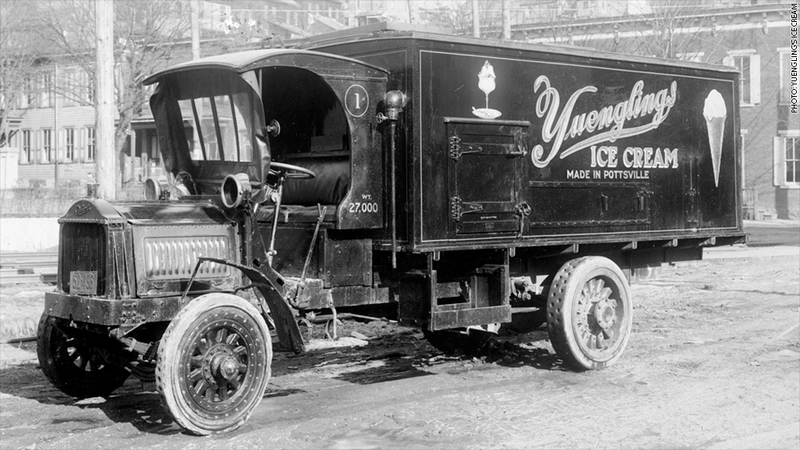 Best known for beer, the family-owned Yuengling brewery launched its ice cream subsidiary in 1920 to help the business survive Prohibition. The dairy branch was spun off from the flagship in 1935, two years after Prohibition ended, but it stopped production in 1985. At that time, David Yuengling wasn't ready to take over the family business from his father. But after spending 30 years in the computer industry, David was ready to revive the ice cream business. Production was expected to start in March, but advance interest from grocery stores like Acme and Weis encouraged him to speed up the process. Quarts of the 10 new flavors hit shelves on Monday. "I think one of the biggest problems people have with new products is name-brand recognition, and we already have that," Yuengling said. Yuengling's Ice Cream remains separate from the Yuengling brewery, which David's second-cousin now owns. The Pennsylvania-based brewery has been family owned since it opened in 1829 and distributes mainly to the East Coast. The ice cream company is also based in Pennsylvania and plans to distribute to stores in the Mid-Atlantic region. And no, beer isn't one of the flavors. But a chocolate and caramel combo is called Black and Tan, sharing its name with one of the six Yuengling beers.